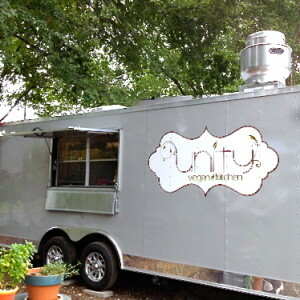 - Unity Vegan Kitchen’s soft opening is tonight! Head on down to their trailer at 2209 E Cesar Chavez (the lot next door to the future Capital City Bakery storefront) between 5:00pm and 8:00pm tonight to try some crab cakes, muffuletta sandwiches, spring rolls and pineapple cobbler. 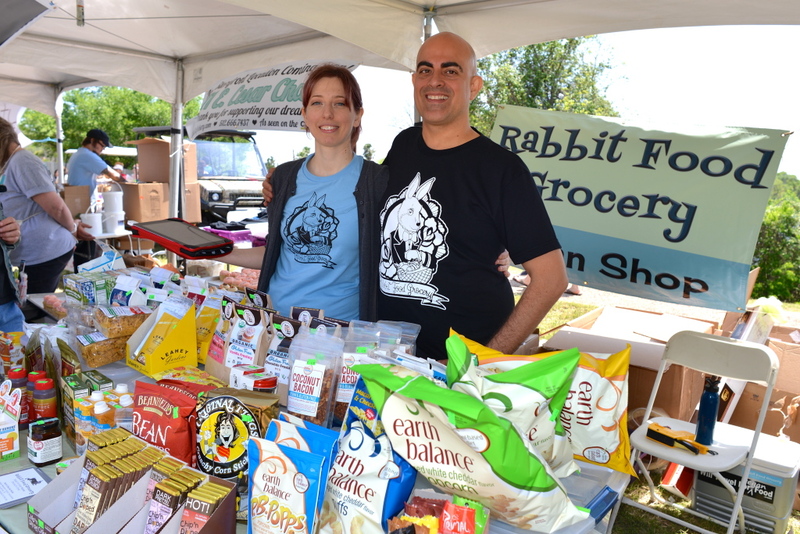 Welcome to the newest Austin vegan trailer on the block! - Bistro Vonish, which offers vegan fine dining supper clubs, has just started a Kickstarter campaign with the hopes of opening a vegan fine dining establishment here in Austin. The rewards for contributing to the Kickstarter campaign are compelling, with t-shirts, meals and fresh baked goods as rewards to help getting the restaurant off the ground. It’s no secret that fine-dining is one thing that the vegan scene in Austin is sorely lacking, so hopefully this will be just the kickstart we need. - Fruit lovers will rejoice at another new trailer on the scene, Health Box. 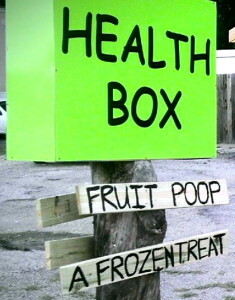 Health Box serves up frozen fruit desserts that are described as ‘fruit poop’. 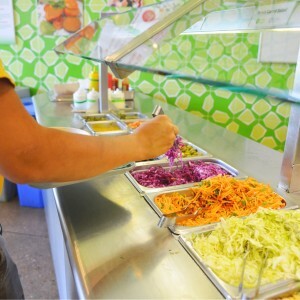 You pick the fruits and vegetables you’d like from their menu, and they serve it up to you sundae style, with different fruit toppings to make your fruit more fruity. ‘Fruit poop’ is just unadulterated fruit and vegetables, with no added sugars or flavorings, perfect for those fruitarians in your life. - There’s a new trailer next to Red Rabbit Bakery on North Loop, and they’re offering vegan tacos! North Loop is already vegan taco central, but it’s Austin, and tacos are practically our official dish, so the more tacos the merrier I say! Head on over to Taco ‘Bout It to try their black bean mushroom, and sweet potato avocado tacos! 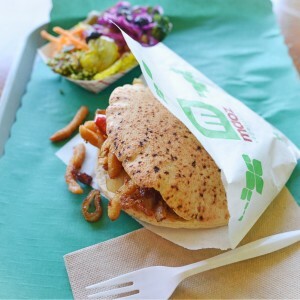 - Maoz, the international falafel restaurant located in the Triangle, has started serving up a new breakfast menu with vegan options! 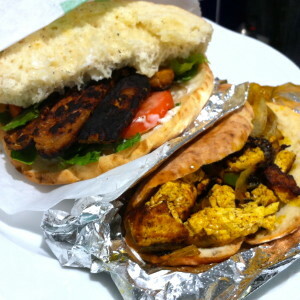 They offer “The TLT”, a tempeh BLT with vegenaise pita sandwich, and “The ’Fu”, a pita taco or pita sandwich stuffed with tofu scramble, sautéed onions and tempeh bacon. 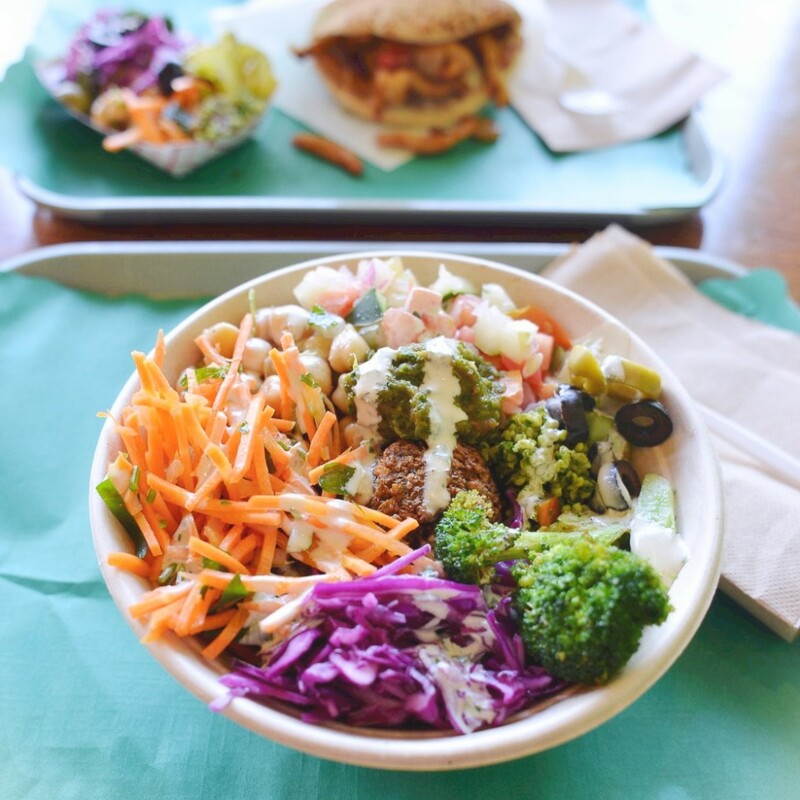 Both options are really tasty, and served up in Maoz’s fluffy pita bread. With breakfast hours Mon-Fri from 8am to 11am, it’s another nice option to have for breakfast up north. 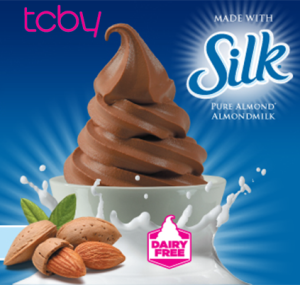 - The national soft serve ice cream chain, TCBY, has announced a new chocolate vegan flavor made from Silk’s almond milk. The chocolate soft serve is available in town at the Martin L King Jr Blvd location near the UT campus and at the South Austin location on Slaughter Lane. 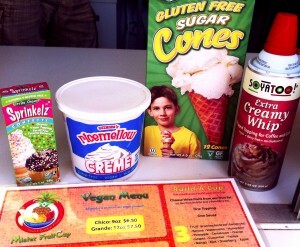 Pair the chocolate soft serve with a number of available vegan toppings including fresh fruit and nuts to complete the picture. - Sauced, the Highland Mall pizza shop, announced that their vegan trial run was so successful that they are rolling out vegan pizza by the slice on Wednesdays and Saturdays! I love pizza, but sometimes (aka most of the time) I’m not in the mood to eat (or pay for) an entire pie. I hope more pizza places jump on this vegan by-the-slice bandwagon. 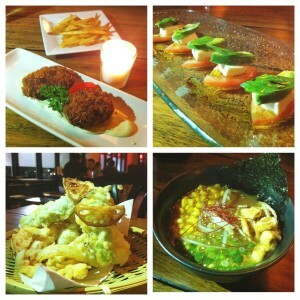 - The Dojo has expanded their vegan offerings! 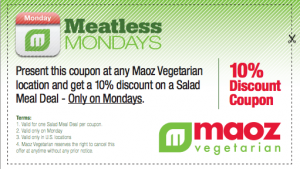 As if 12 vegan menu items weren’t enough, they went ahead and added 5 more! They’ve now marked a few items that can be made vegan upon request, such as their okoge ankake and their okonomiaki style potatoes, added a few salads, and most excitingly, they offer a vegetable set for their new table grills! I will not deny that The Dojo is my new favorite place in town. 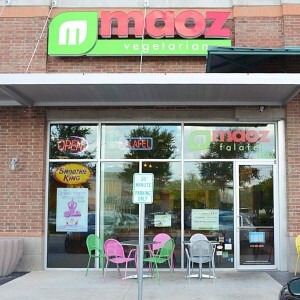 The food is good, the management really cares about its vegan customers, and the atmosphere is super laid back. It’s the perfect place for a casual drink after work, or for a full on party. Speaking of parties, look out for an ATX Vegan Drinks at The Dojo in September! – The annual Ringling Brothers Circus protest is coming up next week on August 21st. Find more information about the event on the Action For Animals Facebook Event. If animal cruelty at the circus is news to you, please check this page out to learn more about the problems with circuses who use animals as entertainment, and what you can do to help. 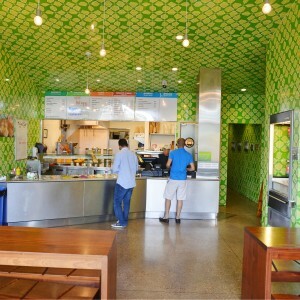 - Since the loss of Austin’s only all vegan catering company to Hawaii, I know a few people have been wondering what catering company is going to fill those vegan shoes. While looking for other vegan-friendly catering companies in town, I was happy to learn that one of latest Natural Epicurian graduates, and awesome Austin vegan Sally Nicely has set up a personal chef/catering company! 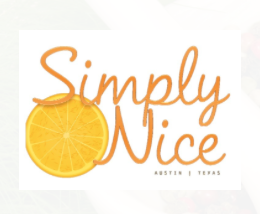 Simply Nice offers catering services, personal chef services and cooking classes, so future Austin vegan events have no fear, our caterer is here! 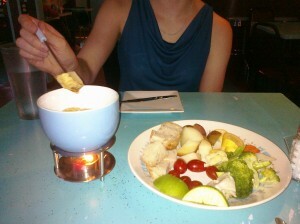 Know of any other local vegan-friendly caterers? Let us know!